Since 1996, this Red Bank BYO has been an anchor of the downtown Red Bank restaurant scene. The Bistro at Red Bank highlights the same passion for market-fresh ingredients it can get its hands on and keeps the techniques simple. There’s an open kitchen and a sushi bar. The eclectic menu proves to have something for everyone, and features a selection of sushi, salads and brick oven pizzas with crispy, thin crusts and both artisanal and classic toppings to homemade pastas. Raw fish is transformed into craveable hand rolls, explosive sauces and pristine sashimi, crispy tempura. Enjoy Bistro Red Bank classics for over 20 years such as Crackling Calamari salad, Peking Duck Salad and Chicken Teriyaki to name a few. We’re located in the heart of downtown Red Bank near the Count Basie Theatre and Two River Theater, and a block from the beautiful Navesink River. After all these years, The Bistro at Red Bank is more exciting now than it ever was! There is no other Red Bank BYO that has progressively pushed the culinary envelope like The Bistro has! Chef/Owner George Lyristis grew up in the restaurant business. At the young age of 19, he ran his first kitchen as executive chef. At 26, he and his brothers, Charlie and Taso, opened up The Bistro in 1996. Over the last 25 years, he has made his mark with Bistro, Teak, and his latest concept; the fast casual Greek Eats which is expanding locations through New Jersey. All the while, he has managed to be a valuable member of the Red Bank community, with food donations to numerous local philanthropic organizations. Since serving as the original Chef in 1996, George Lyristis has been the creative culinary mind behind The Bistro at Red Bank, as well as Greek Eats & Teak. In 2018, the creative culinary team behind The Bistro at Red Bank expanded, with the addition of Chef Anthony Ferrando – former Chef/Owner of Dish Restaurant in Red Bank. Anthony brings decades of experience to the kitchen at Bistro, having spent 14 years at Dish and prior stops at places like the legendary Rao’s in New York City. Together, George and Anthony are elevating this Red Bank BYO to new heights! 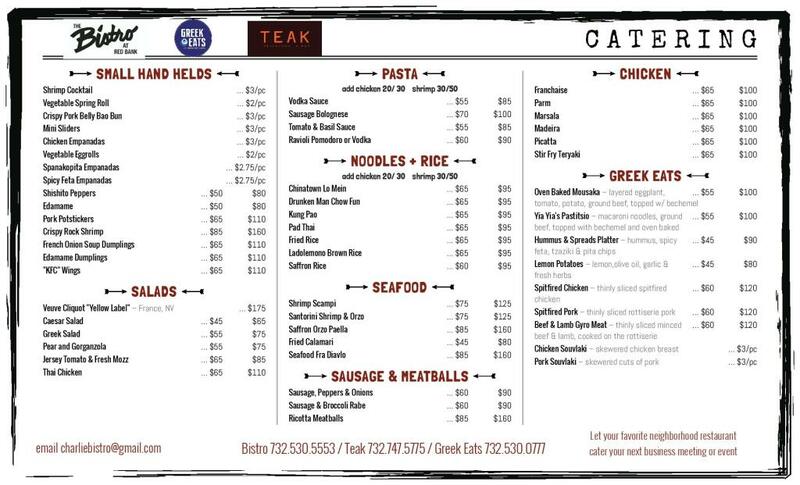 Our menu has evolved since we opened in 1996. As a Red Bank BYO, we’ve pushed the local creative culinary envelope for over two decades. Let us host your next private party in Red Bank. We can accommodate bridal showers, baby showers, birthdays, communions, rehearsal dinners or any of life’s special events. Give us a call at (732) 530-5553 for more information. Let us Cater your next affair and make your next PARTY PERFECT! We will arrange everything for you and make your party a guaranteed success. With our catering and rental department all under one roof you need to look no further for your party needs. Our rental department has tables, chairs, tents, chafing dishes and all your party needs. So, SIT BACK, RELAX and allow us do to make your next PARTY PERFECT! Choose from our party packages or our party trays. Feel free to ask about customizing your party to suit your needs. 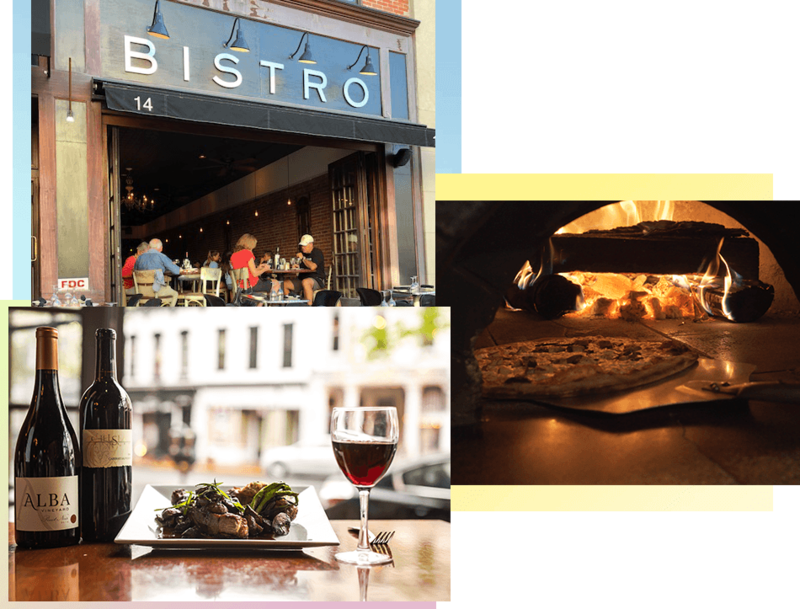 Looking for a gift card to The Bistro at Red Bank? Purchase one online using the form below. To make a reservation, please give us a call at (732) 530-5553 or fill out the form below.